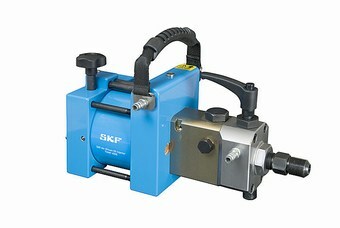 SKF announces a new range of air-driven hydraulic pumps and oil injectors. (THAP series) to mount and dismount a variety of shrink fit mechanical components, such as couplings, bearings, flywheels, marine propellers, railway wheels etc, using SKF’s oil injection method. The new range is lightweight and combines portability with power compared to similar air driven tools and hand operated pumps and oil injectors, which results in considerable savings in time and effort. The solution weighs just 13.5 kg. SKF’s oil injection method has well been known for many years, as a simple, efficient and safe method for mounting and dismounting annular components such as bearings, marine couplings and propellers, gears and railway wheels. To suit these varied applications, the new range consists of four tools with hydraulic output pressures varying from 30 MPa to 400 MPa (4,350 – 58,000 psi). Thick hydraulic fluids up to 900 mm²/s, typically used with SKF’s oil injection method, can be efficiently handled by the range. To suit the varied fields of use, a comprehensive range of accessories including, high pressure pipes, connectors, adapters and pressure gauges complement the new air-driven hydraulic pumps and oil injectors The new air-driven hydraulic pumps and oil injectors are also available to order as sets, which are supplied complete with the appropriate accessories for the item supplied.